Almost 30,000 people braved 40-degree weather and rain to compete in the Boston Marathon on April 20, 2015. Half a million more spectators lined the legendary course, which passes through eight Massachusetts cities and towns, to cheer on friends, family members, and strangers. Just two years after a pair of bombs went off near the finish line, killing three and injuring more than 260 racers and spectators, city and state officials focused on making the event as secure as it is festive. For that to work, they needed to give hundreds of people real-time data and maps that could be accessed on any device. 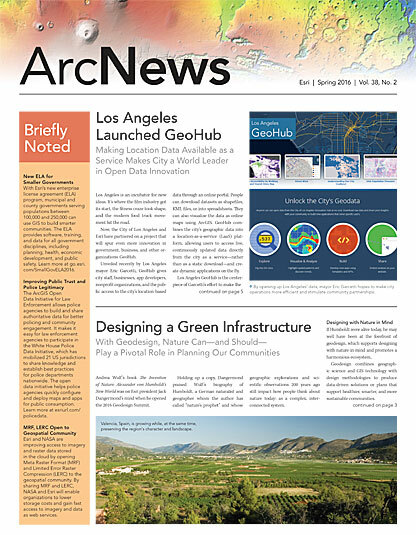 ArcGIS Online—a secure, software-as-a-service solution that comes with apps and app builders for the office, the field, and the community—was the clear choice to run security behind the scenes. Desiree Kocis moved to the Boston area in early 2015 to work for the Massachusetts Emergency Management Agency. Although new to the city and to marathons, Kocis is a highly skilled GIS professional, adept at working with maps and data. As the agency’s GIS coordinator, she set out to build an online operations dashboard that could track everything—including runners, weather, traffic, emergency vehicles, and medical situations—and be accessible on desktop computers, tablets, and smartphones. The bomb squad used the maps displayed in the Tactical Operations Room to identify the locations of suspicious or unattended packages. Photo courtesy of the Massachusetts Emergency Management Agency. In just six weeks, Kocis learned how to use ArcGIS Online to build what turned out to be the highly successful 2015 Boston Marathon Dashboard. Using Operations Dashboard for ArcGIS (one of the apps included with ArcGIS Online), Kocis was able to provide security personnel and emergency responders with a real-time view and common operating picture, complete with live data feeds and widgets for maps, charts, gauges, and histograms. The 2015 Boston Marathon Dashboard featured dynamic web map layers, including live weather and traffic, real-time tracking of runners and emergency vehicles, and information about emergency operations. It hosted 20 static layers that could be turned on or off as needed to show helicopter landing pads, National Guard staging areas, or medical facilities. In case of an emergency, all responders involved could quickly zoom in to emergency shelters to see their status changes, capacities, key contacts, and phone numbers. 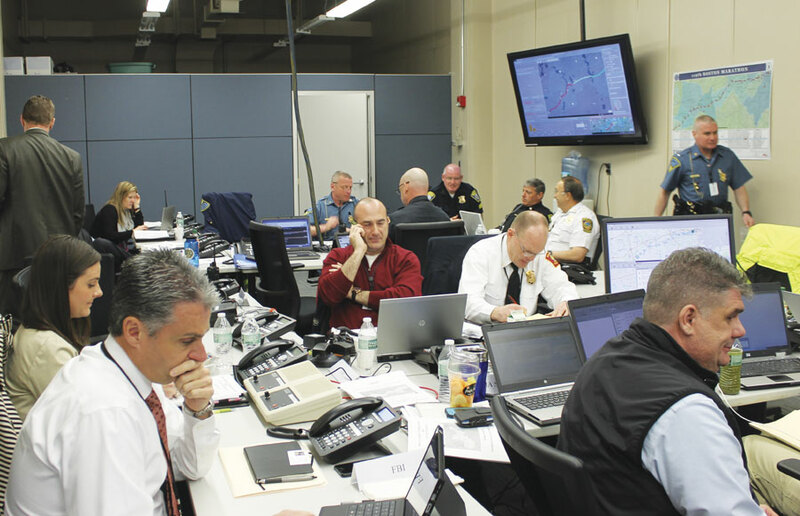 On the day of the race, 300 people from 60 different agencies, including state and local police and the Federal Emergency Management Agency, used the dashboard at the Multi-Agency Coordination Center (MACC). An additional 200 people in the field and around the country accessed the dashboard using ArcGIS Online. Everyone could follow the runners, weather, and emergency operations; tune in for race updates; and zoom in for more specific information. For the dashboard to work that Marathon Monday, a considerable amount of data had to be recorded on the ground and shared with all 500 people charged with keeping racers and spectators safe. Each marathon participant was given a bib to wear that contained a race number and a chip. The chip registered each competitor’s time and location at mats placed every five kilometers along the course. That data was pushed into a feature service using ArcGIS GeoEvent Extension for Server, which processed incoming data in real time. This helped keep track of how many runners, wheelchair racers, and handcyclists crossed each mat and how many of them were in each section of the course, enabling security and medical resources to shift accordingly along the route. The dashboard featured dynamic web map layers, including live weather and traffic and real-time tracking of runners and emergency vehicles. Photo courtesy of the Massachusetts Emergency Management Agency. Crews on the ground used Collector for ArcGIS on their iPhones to respond to falls and other injuries. With the app (which is also included with ArcGIS Online), they tracked police cars, ambulances, and other emergency vehicles in real time. So when a runner needed medical attention, the app—working online or offline—could locate the nearest ambulance or medical station. Every hour throughout the race, Kocis updated the map’s weather layer in ArcGIS Online as well. For maximum accuracy, she built the weather widget to include three different weather hot spots along the 26.2-mile route. Her hourly updates were automatically fed into the widget and shown on the dashboard map. ArcGIS ended up being central to the security efforts of the 2015 Boston Marathon, and Kocis was thrilled with the results. “I felt such an amazing sense of accomplishment that I was able to contribute to the safety of the runners and spectators, of the cities along the course, and of the infrastructure of the commonwealth,” she said. As Kocis and everyone who was part of the MACC learned, that same ethos can hold true for technology. 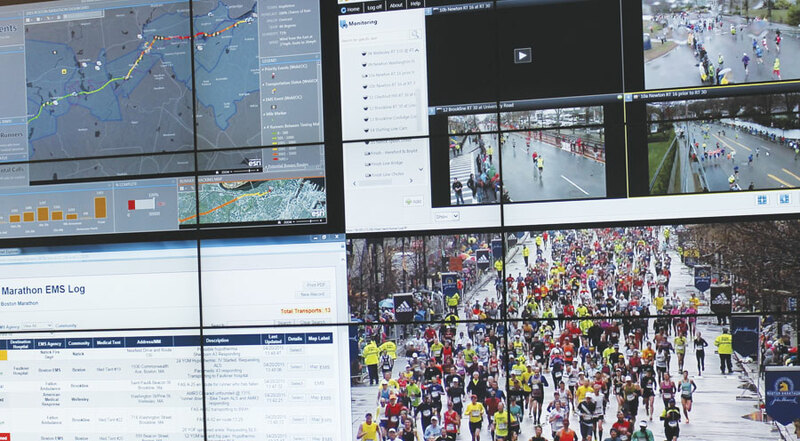 During the 2015 Boston Marathon, GIS connected people to essential information and each other in the spirit of safety and goodwill. This historic marathon, which unites a region and attracts runners from around the globe, has long been a way to celebrate the good things in life. In 2015, GIS was one of those things. Kocis compared the work of those who planned and secured the Boston Marathon to the work of the runners, who spent months training and preparing.